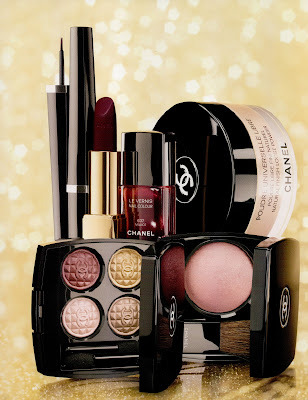 Beauty of interest: Chanel Eclats du Soir de Chanel Holiday 2012 collection! Chanel Eclats du Soir de Chanel Holiday 2012 collection! This year Chanel came out with a festive but rather uninspired collection for this holiday season called 'Eclats du Soir'. Although this collection is luxurious with that touch of elegance which is so typical for Chanel, it pales in comparision with other holiday collections out there. I know many of you might disagree with me but this has not been their best collection so far. The eye shadow quad is called 'Harmonie du Soir' and it looks simular to Topkapi which was released in the holiday 2011 collection. These colours are softer and more muted compared to the original Topkapi. It created a pretty everyday look but none of the shades gives enough dimension that I'm looking for in a great eye look. The colours of Topkapi seem to work more harmonious together than Harmonie du Soir which is the reason why I decided not to get it. The 2 items I did get from this collection is the #307 L'Impatiente Rouge Allure Velvet lipstick and the #637 Malice nailpolish. 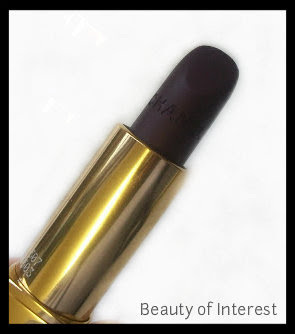 L'Impatiente is a very dark berry red colour that doesn't go as black on the lips when it has been build up. The shade looks darker in the tube than in real life which makes it shade really wearable compared to the oxblood lip shades that have been so popular recently in the make up world. Texture is not as creamy as the regular Rouge Allure but still comfortable on the lips with a matte finish. The colour really is gorgeous but hardly unique. It wasn't drying on my lips but I heard some people who have issues with the Rouge Allure Velvet texture so test it first before buying it. 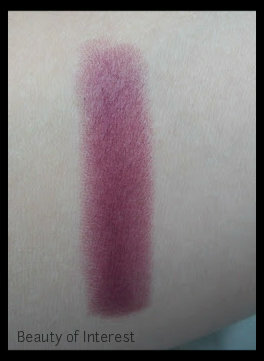 For those who wants a wearable, not in your face dark vampy lip shade; L'Impatiente will be right up your alley. 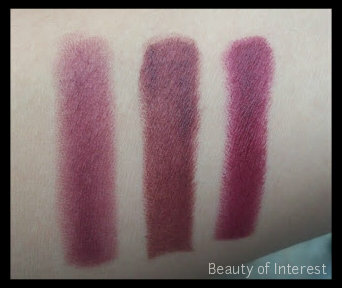 Here are some swatches of L'Impatiente itself and compared with other simular lip shades. and Tom Ford Black Orchid. Next item I purchased is the Malice nailpolish. At first I thought it would be very simular to my beloved Rouge Noir nailpolish but afterwards I saw that I was wrong. Malice is darker and is more of a burgundy red on the nails. 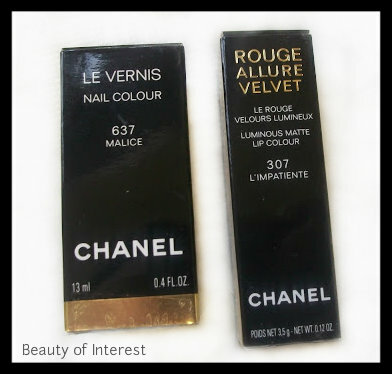 Like all Chanel polishes, a base coat is needed to make it last longer. The practical brush that comes with it makes application really easy and since it's so opaque, 1 coat would probably be enough. Texure is creamy and rich and with very subtle ruby sparkles in it that catches the light and like most Chanel polishes it gives a glossy finish on the nails. Malice polish on my nails. 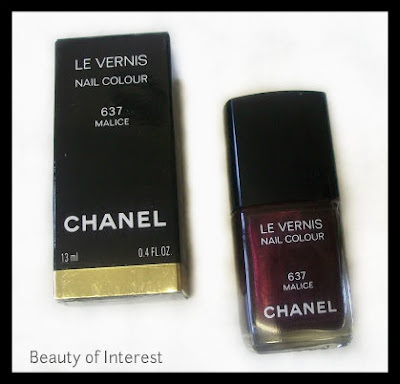 Chanel nailpolishes are not my favorite in term of texture and longevity but the colours really do make up for that. L'Impatiente retails for $32 USD or (30,50 EUR) and Malice for $26 USD (or 22, 50 EUR) and both can be purchased at any Chanel counter and online.